Not all mysteries have to revolve around crimes and murders. Sometimes it’s a simple matter of piecing together a series of clues until you arrive at a solution. 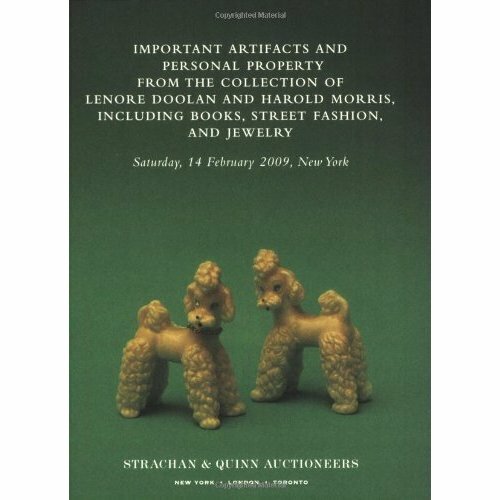 Important Artifacts and Personal Property from the Collection of Lenore Doolan and Harold Morris, Including Books, Street Fashion, and Jewelry by Leanne Shapton is a 2009 auction catalog put out by the fictional Strachan & Quinn Auctioneers. It contains the effects of Lenore Doolan and Harold Morris, a New York City couple, who were together from 2002-2006. These objects – mementos, scraps of paper and collected junk – form the narrative of the rise and fall of their relationship. The book is both brilliantly conceived and executed. A thank-you note from Ann Doolan to Lenore Doolan, on printer paper. Read in part: “Sis, thanks for letting us crash, so pls thank Hal for taking YOU in. I really like him – I think he’s a good guy for you. Are things getting more serious? Noticed you’d given him a shelf for Count Chocula (we snuck some). I thought sugary cereal was a total dealbreaker for you! True love?? X, Anny and Tom.” 11 x 18 1/2 in. Shapton tells her story through scribbles on paper napkins, letters, notes stuck in books, photographs and a variety of used objects. 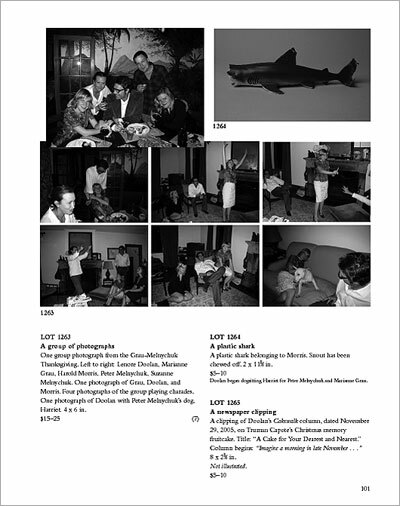 Everything is presented roughly in chronological order, but the reader comes to understand events only through their own inferences into and interpretations of the items being sold in the multiple lots. Nothing is spelled out. Despite that, a surprisingly clear story quickly takes shape. It’s a shame that this book isn’t more mainstream, because I couldn’t imagine a better book club selection to provoke discussion. What is so striking about Important Artifacts and Personal Property is how it reeks of authenticity. New York apartment dwellers treat their homes a bit like gypsy caravans and the assortment of second-hand objects represented in the catalog fit perfectly into that lifestyle. Slightly seedy thrift shop dresses, used VHS tapes of Annie Hall, a taxidermy squirrel and a collection of salt shakers – this mismatch of things wouldn’t be out-of-place in an East Village apartment. (I had one friend who kept a collection of candy colored Buddha’s still in their candy machine plastic bubbles on a shelf with a human skull from drawing class and much- loved Joni Mitchell CD’s). The result is that the reader believes… That these things once belonged to Lenore and Harold and that it is possible to bid on what amounts to debris left in the wake of a relationship. Leanne Shapton has succeeded on two fronts: she has not only convinced us of the existence of two people who may never have existed by providing visual proof, but she has also created a diorama of a specific way of life in a specific time within a specific city. Important Artifacts and Personal Property is a demonstration of how objects can define us not only as individuals, but tell the broader story of how we lived our lives. Looks interesting. I’ll have to check it out. I hadn’t heard of this title before, so thanks for waving it around so I could see it (so to speak). I hope you enjoy it. If you decide to review it after you’ve read it, please come back and leave the link in a comment.